Our client is active in the processing of potatoes in Belgium. They produce a wide range of pre-fried and frozen potato products. The customer was looking for a solution for hot air extraction. In addition, this air was loaded with fat residues. 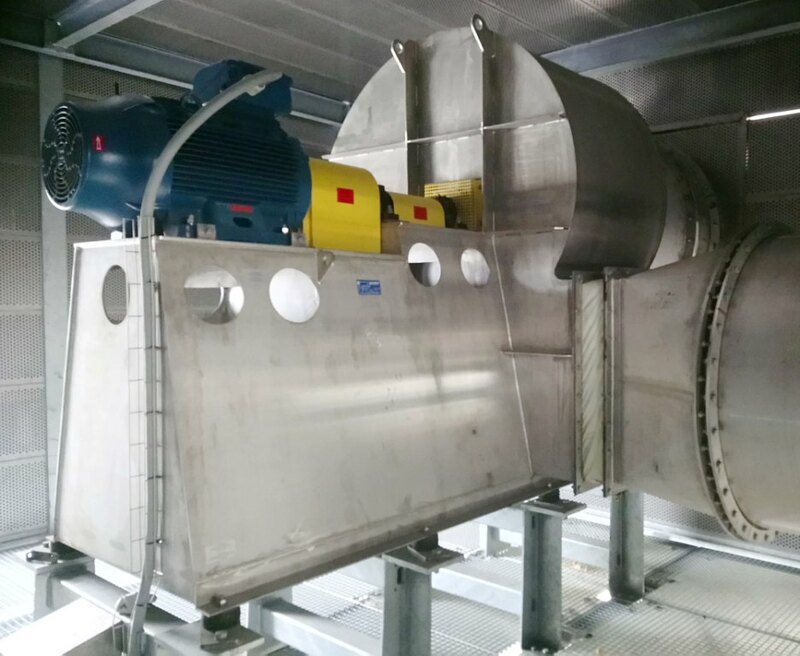 For this application, we have developed a centrifugal fan of the CVX type. Due to the presence of food and the continuous contact with hot and fatty air, we opted for a stainless steel construction. Stainless steel constructions are more resistant to corrosion and multiple aggressive cleaning. The 75kW motor drives the fan via a flexible coupling. This makes maintenance of the installation easier. The fan itself has a diameter of 1.120 mm and is located under an acoustic box. The noise level is thus kept to a minimum. Is your company active in the potato industry? Or are you looking for a centrifugal fan? Do not hesitate any longer and contact us. We will be happy to help you choose the most suitable solution for your requirements.